Book gods : "Stacia, you've had a rough reading week. It's time that we allow you a moment of rest. Go forth and enjoy this familiar author as you relax in our favor for this brief moment. "Me : "Thank you, sirs and madams. I will try not to squander your gift. "3.5 stars. I had to deduct half a point for an ending that should have been cut off about 30 pages sooner.I'm officially refreshed now. Kleypas never fails to entertain me. The formula still stands as successful as ever. There are no witty quips to share this time but I'm okay with that. Zachary was my kind of hero (...except for that ever-persistent chest hair that Kleypas seems to favor on her male leads. Springy chest hair has never sounded attractive to me.). He fights (as in bare-knuckle boxing), he swears, and he knows how to please a woman. Society be damned, he's going to fit in without the help of noble gentlemen. If he can't buy respect, he'll win it. And this time he's out to win the heart of Lady Holland. The sound of his voice stunned her...a deep purring rumble, like the voice of Hades as he dragged an unwilling Persephone down to his underworld kingdom.I loved that the book opener was about two strangers meeting during a chance encounter in the dark - our hero mistaking Holly's identity for another :"We're strangers in the darkness," he whispered back. "We'll never be together like this again. No, don't pull away. Show me how an evening can be magical. "There's no real point in me going through my likes and dislikes as I would with another book or author. 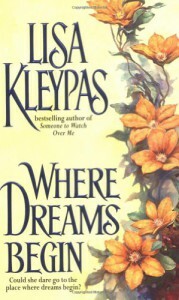 Kleypas doesn't change much in style from book to book, even though there are some stories which are better than others. This one falls somewhere in the middle for me - not the best, not the worst. I go with this author mainly when I want the familiar comfort of not having to work too hard in order to find myself lost in a story. If you like her historical romances, then you'll want to check this one out. It's always worth it just to see a large, alpha-male type brought to his knees :"What we just shared, Holly...I don't know if it was a communion of souls, but it was the damn closest I'm ever going to get."